MOSCOW. Nov 21 (Interfax) – The Arctic is important for Russia, Russian President Vladimir Putin said. 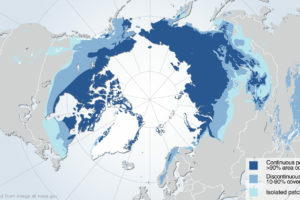 “The Arctic plays a strategic role for Russia. Today we are strengthening our presence in the region, we are implementing scientific research initiatives, large-scale programs for its economic development, we are implementing ambitious infrastructure projects,” Putin said in his message to the participants and guests of the forum Arctic Days in Moscow, which was posted on the Kremlin’s website on Wednesday. Russia understands very well “how important it is to preserve the environment and protect the natural diversity of polar and subpolar territories,” Putin said. “The intellectual and creative potential of authoritative expert sites such as the Federal Arctic Forum” should be used in this work, he said. Among the forum’s participants are representatives of the indigenous peoples of the North and the Far East, international organizations, scientific and business circles, bodies of state authority, and the media.